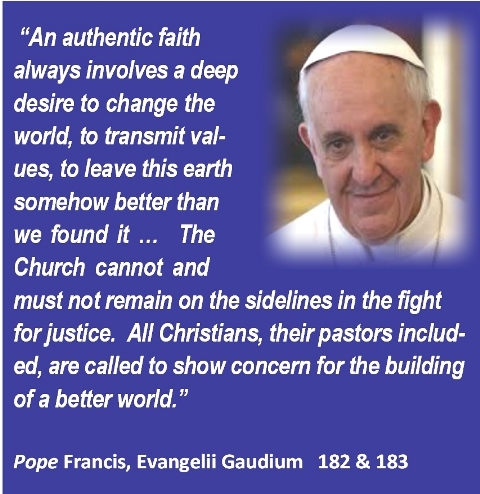 Introduction: Based on Scripture and Catholic Social Teaching this programme aims to provide Catholics who wish to engage in work for Justice and Peace and Care for Creation with a solid understanding of what our faith teaches as the starting point for a Christian response to justice issues in our world. The programme was developed and delivered as a foundational training for individuals and Parishes that wish to participate in or set-up Faith and Justice groups. The overall aim of the programme is to promote the just living that is essential to living our faith as individuals and as Christian communities. 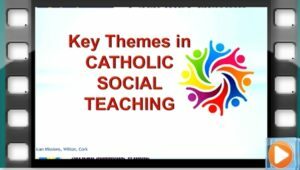 The Presentations are delivered by Bishop Patrick Harrington SMA and by Mr Gerry Forde, SMA Justice Officer. Click on the images on the left to view each video presentation. Each Presentation begins with the same short Introduction and then moves on to its particular topic i.e. 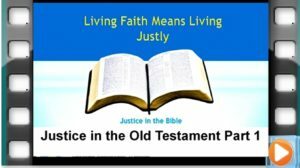 Justice in the Old Testament (in two parts), Justice in the New Testament, Key Themes in Catholic Social Teaching and finally Care for Creation which is a major Justice issue in our time. 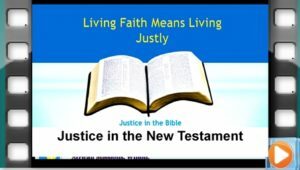 Accompanying each presentation is a leaflet which can be viewed or downloaded, and which contains references for all Scripture and other quotations used in the video presentations. Click on the links below to access a leaflet for each of the video Presentations.